In a saucepan, mix together the jelly, barbecue sauce, and garlic. Heat, stirring frequently, over medium-high heat until thoroughly mixed and hot. Add the cooked meatballs and enjoy! Add the frozen meatballs to the crock of a slow cooker. Pour in the jelly and barbecue sauce then add the garlic. Kinda mix it together (you can stir it more thoroughly once it's hot). Cook on high for about 3 to 4 hours or on low for about 6 to 7 hours. Stir more thoroughly and enjoy! Place a trivet in the bottom of the pressure cooker. Add the frozen meatballs and the 1 cup water. Meanwhile, in a saucepan, mix together the jelly, barbecue sauce, and garlic. Heat over medium-high heat, stirring frequently, until well mixed and hot; set aside. Natural release pressure cooker. Drain water. 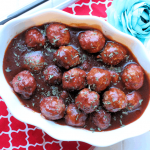 Add sauce to meatballs (or meatballs to sauce, whichever you prefer), mix together, and enjoy! When I made this recipe, I used the Healthy Turkey Meatballs from iFOODreal. To make it on plan with THM, I used the leanest possible ground turkey meat and, instead of using two whole eggs, I use one whole egg and one whole egg white.